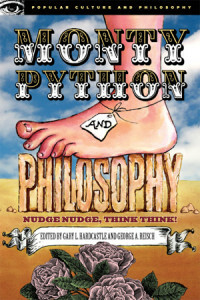 Scott interviews Prof. Gary Hardcastle, senior editor of the book Monty Python And Philosophy, about gender roles (“I’m not an old woman!”), Holy Grails (“Naughty Zoot! You turned on the Grail beacon again!”), and questioning authority (“How did you get to be king? I didn’t vote for you!”), as they have a few laughs and consider how the very irreverent portrayal of Arthurian lore in Monty Python and the Holy Grail (and the musical Spamalot) reflects our modern understanding – and mistrust – of the knightly ideals. We apologize for any confusion this miscalculation may have caused. All those responsible … have been sacked.